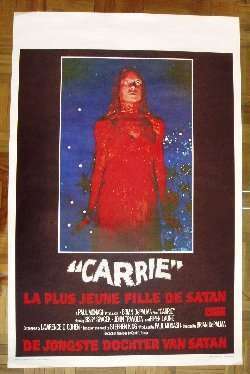 This is from our collection of Belgian Movie posters and Film posters: CARRIE. 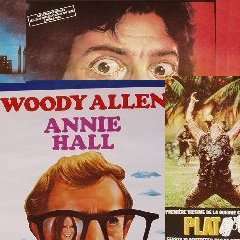 Belgian film posters are famous for their colourful art and multi-lingual (French-English-Dutch) titles. All these are used posters, sometimes still bearing the original theatre stickers. Belgian posters became very popular with collectors because of their beauty and size. They're much easier to frame & display than larger formats. Belgian posters are among the most beautiful in the world. Please note that all prices include packing and postage Prior + Airmail, worldwide! all the movie posters & film posters on this page are in stock! (we remove an item from this page the moment it is sold). All prices are worldwide shipping costs p&p included! Take note that this is a movie poster that has actually been used by the local cinema to advertise the film. Price INCLUDES brand new hardboard TUBE to send the movie poster! A great gift for the collector, De Palma fan, Horror movies fan, Sissy Spacek fan! Price: $ 50.00 p&p inluded, worldwide! this poster is still in stock.